While American taxpayers shell out millions of dollars for “special counsel” Robert Mueller to investigate a hoax — that the Trump campaign colluded with Russia to “steal the election” from Hillary Clinton — the White House has a full-blown case of real collusion between the Putin government and the Clinton Foundation that it should be pursuing. In addition, agents obtained an account by an eyewitness that was substantiated by documentation that Russian nuclear actors routed millions of dollars to the U.S. specifically to benefit Bill and Hillary Clinton’s ‘charitable’ foundation while the latter was serving as secretary of state, and on a government body that gave a thumbs-up to the deal. In an affidavit some years later, one FBI agent would declare that the racketeering scheme occurred “with the consent of higher level officials” in Russia, who then “shared the proceeds” from the kickbacks. 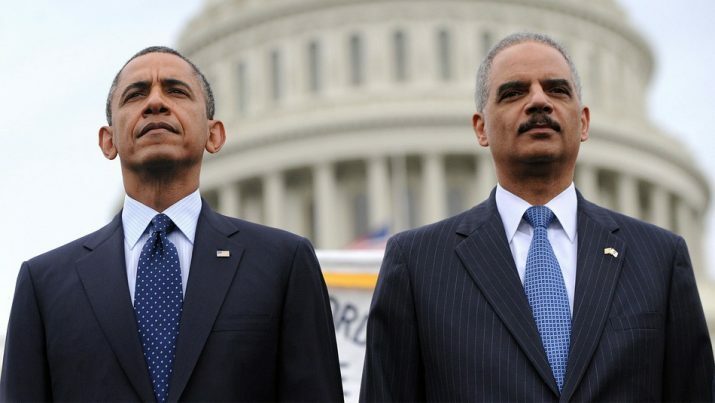 But instead of bringing charges immediately in 2010, Obama’s corrupt Department of Justice, then led by former terrorist-defending Attorney General Eric Holder, dragged its feet for another four years under the guise of ‘continuing the investigation.’ During that time, the American people were clueless to the treachery that had taken place, even as Hillary Clinton rose in the ranks of her equally corrupt Democratic Party to become its presidential nominee. During the four-year stint, the Obama administration made two key policy decisions that benefited Putin’s commercial nuclear objectives, per The Hill. The first came in October 2010, when the State Department under Clinton and other agencies on the Committee on Foreign Investment approved unanimously the sale of Uranium One, a Canadian mining company, to Russia’s state nuclear company Rosatom, which gave Moscow control over 20 percent of U.S. strategic reserves. When Trump brought this deal up on the campaign trail last year, a spokesman for Clinton’s campaign said she had nothing to do with the review and approval (which we know now was BS). “The Russians were compromising American contractors in the nuclear industry with kickbacks and extortion threats, all of which raised legitimate national security concerns. And none of that evidence got aired before the Obama administration made those decisions,” said a person who worked in an interview with The Hill. The source spoke on condition of anonymity for fear of retribution by U.S. or Russian officials. The controversy over the sale began in 2015 after the release of a book by author Peter Schweitzer and a story by The New York Times detailing how millions of dollars flowed to the Clinton Foundation and Bill Clinton’s pockets as the uranium deal progressed. The Obama regime and the Clintons have all denied any wrongdoing, saying there was never any collusion or evidence of criminal activity. This is the real collusion as it relates to the last election cycle, not the myth that Mueller is investigating. That’s merely a concocted distraction by the Deep State to ensnare Trump and keep the heat off the real criminal actors. The president should instruct Attorney General Jeff Sessions to appoint a real special counsel to get to the bottom of this. Crimes have been committed, and people need to go to jail over them.